Premium Starting Fluid Johnsens 6732 / BOWES CH 6732. 7.2oz Can. 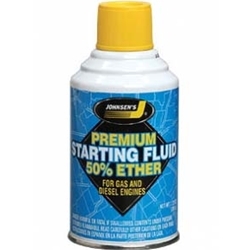 Johnsen’s Premium Starting Fluid is a 50% ether blend formulated to help start stubborn engines fast in cold weather and to save batteries. Also contains upper cylinder lubricant.